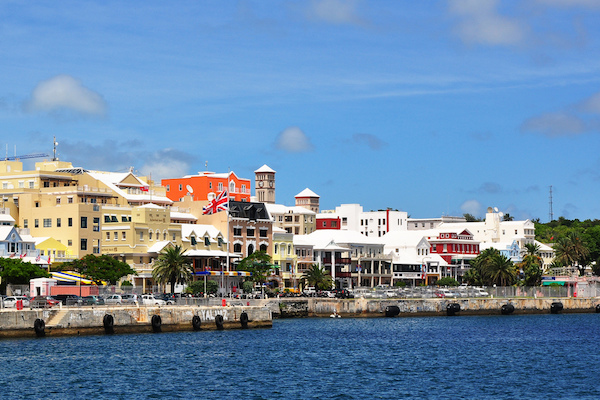 Located on the north side of Hamilton Harbor, Hamilton is Bermuda’s capital and a major port. It’s small, with a permanent population of only about 1,000. Hamilton is a lovely spot for running in Bermuda, with the waterside Front St., pleasant side streets with colonial area buildings and several small parks, a scenic harbor, and historic Fort Hamilton. We’ve designed a quick, 4- mile ‘Hamilton Highlights’ tour. We start at the ornamental iron gate at Queen Elizabeth Park (formerly Par-la-Ville Park) at the Historical Society Museum/National Library. Take a jaunt through the pleasant park paths, down to the water and cross Front St. for a loop around the waterfront Point Pleasant Park, past the Yacht Club and Barr’s Bay Park. For an extra half mile or so, continue west on Pitts Bay Rd. and do another little loop to the the waterside edge of the Hamilton Princess Beach Club, using Waterloo Ln. Come back up to Pitts Bay, and run east along Front St., and then on E. BroadWay and Crow Ln. for 1.7 miles, past the Flagpole, Cabinet Gardens, and Hamilton Docks, until the rotary, with pleasant water views. Turn around and run until King St., Head north on King, and then enjoy a hilly little loop around the paths of Fort Hamilton. The final section of the run heads back west along Reid St. and north on Parliament St. past the back of the Cabinet Building, and Sessions House (for a quick glimpse at the Church of the Holy Trinity, take a quick left on Church St.). Take a LEFT on Dundonald and then run back down to the water through pretty Victoria Park, and the grounds around Hamilton City Hall and Arts Center. Longer/Add-On Options: Add some of the pleasant, sidewalked side streets of Hamilton. The Bermuda Botanical Gardens and Arboretum are a mile away. To access the Botanical Gardens, use Berry Hill Rd. For the Arboretum, use Lane Hill Rd./Cavendish/Middle Rd. Map: Runseeing Tour Map: Harbour Rd.